How can the sea recycle our trash? What do people do with sea glass? Today’s Wonder of the Day was inspired by Todd from Hamilton, IL. Todd Wonders, “Can you sell sea glass?” Thanks for WONDERing with us, Todd! From stained glass windows to jewelry, glass has been used to create works of art for thousands of years. Today we're taking a look at a special type of glass that many people collect and use to make jewelry and works of art. So what's so special about sea glass? Would you believe the ocean recycles our trash into something beautiful? It's true! Sea glass can be found on beaches along oceans, seas, bays, and even large rivers and lakes. These beautiful, frosted, smooth pieces of glass go by many names, including "sea gems," "beach jewels," "mermaid's tears," and "sea pearls." Sea glass consists of pieces of glass that have been smoothed over time by the tumbling action of water, waves, and sand. As pieces of glass soak in salt water and get tossed against the sand by the waves for anywhere from 5 to 50 years, all the sharp edges and corners become smooth. The pieces of glass also take on a frosted look due to the way the sand etches the surface of the glass. Sea glass starts out as trash glass from sources like bottles, jars, glasses, plates, windows, windshields, or ceramics. Unfortunately, the world's oceans end up being a dumping place for all sorts of trash, whether from ships or from those who live near the sea. Luckily, when it comes to glass, the sea does a great job of recycling pieces of glass into treasures for people to find along beaches. In fact, searching for sea glass is a popular hobby for thousands of people. Some people collect pieces of sea glass in large jars. Others collect the pieces and turn them into beautiful pieces of jewelry or art. Many people who collect sea glass also enjoy trying to figure out the history behind each piece of sea glass. One way to figure out what type of bottle a particular piece of sea glass came from is to examine its color. 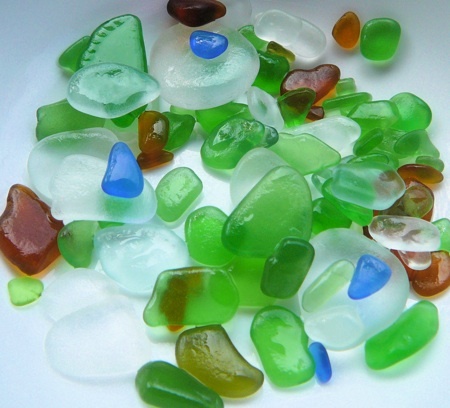 The most common colors of sea glass are green, brown, blue, and clear. These colors tend to come from bottles of popular drinks, such as sodas and juices. The rarest colors tend to be gray, pink, black, yellow, turquoise, red, and orange. These colors come from rare items, such as old plates, wine bottles, and boat lights. Although sea glass can be found all over the world, certain areas are known for their sea glass. These areas include the beaches of the northeast United States, California, northwest England, Mexico, Hawaii, Puerto Rico, Australia, and Italy. Sea glass can also be found on beaches that border large lakes, such as the Great Lakes. Since these bodies of freshwater have fewer waves, the sea glass they create looks different than that from oceans. It's usually less weathered and may even still have some shiny spots. Some people call this “beach glass" to distinguish it from true sea glass. Today, sea glass can be harder to find than it was in the past. Not only are more people searching for it and collecting it, but many glass items have been replaced by plastic. Fortunately, there also appears to be less littering today than there was in the past. The increasing scarcity of sea glass has led some people to try to create their own homemade sea glass. Using different types of glass in a rock tumbler, some people are able to create inexpensive versions of their own homemade sea glass. Unfortunately, true sea glass with its smooth, frosted appearance just can't be duplicated by such artificial means. We think tomorrow’s Wonder of the Day is one you can really plug yourself into! It might be nearly impossible to duplicate the weathering action of the seas, but that doesn't mean you can't make other incredible pieces of art with glass. For example, try making your own Stained Glass Jars at home. Do you have a refrigerator at home? We bet you do? What do all refrigerators need? That's right! Magnets! Create your own DIY Glass Magnets following the instructions online. If you're lucky enough to have some sea glass, you can try these Sea Glass Crafts described online. You may be able to find some sea glass if you live near a beach, or you could also try to find some to order online. Have fun! 😀 Thanks, Wonder Friend! Have you ever seen sea glass before? That's awesome, a person! Sea glass is very pretty, and it's very interesting to learn about! What colors are the pieces of sea glass that you have? I really like this wonder. Sea glass looks so cool!!! I ever knew it was made by trash!!! That's awesome. Hello Wonderopolis!!!!!! I love this wonder!! I never understood sea glass until now when you guys did this wonder, and I am so happy that you chose to do a wonder on sea glass!!!! I love the sea glass idea. I really didn't know how cool sea glass was/is. I think I want to start collecting it. I love this cool thing now!! I have lots of sea glass, it is so pretty (for the most part). I love wonders that I can relate to. Hi, this is Betty from Mrs. Caplin's class. I think this is the most interesting wonder I have ever read this year. I learned more than 7 facts. One of the facts I learned is that sea glass can be found in beaches, oceans, seas, bays and even large lakes and rivers. I only thought there were 2 names for sea glass. I thought they were Sea Gems and Sea Pearls, BUT there are 4 different names and they are "Sea Gems", "Beach Jewels", "Mermaid Tale" and finally, but not least "Sea Pearls." I WONDER when the scientist first found the Sea Glass. In Beaches, Oceans, Seas, Bays or large Rivers or Lakes. From this paragraph I learned BILLIONS of facts. Glass soaks in salt water and gets tossed against sand by the waves from anywhere 5 to 50 years ago. Sharp edges and corners become smooth because of that process. I also learned lots more facts than that, but it will take up lots of pages, so I can't write that much. If we ever learn about Sea Glass in Science, I would be an expert at this and get straight A's. Thank's for this PHENOMENAL WONDER of the day!!!! Hey, that was really cool because they told me all my questions. I did and I like the video. Did you make this website? OMG! I use to live in Puerto Rico and find glass all the time! We hunt sea glass on the shores of Lake Huron! And YES, there is a purple/blue-ish variety! It's VERY special if you find it because those color pieces are few and far between! Wow, that is real cool. I knew that there is sea glass, but I did not know that it is recycled glass. That is cool. Try to figure out my name. Wow, I did not know that sea glass can be found in the Great Lakes. I LOVE sea glass and hunting for sea glass, too. This Wonder makes me want to return to the beaches of Grand Turk and spend a lazy afternoon beach combing in the warm sun! This was cool. I enjoyed the short video, too. I watched a show on the Discovery Channel about where sea glass comes from and how it smooths and changes the look and feel of the glass. Plus, one of my mom's friends collects sea glass and makes cool little projects with the bits and pieces she finds. Dear Wonderopolis, Sea glass is pretty cool! I WONDER, is there purple sea glass? Purple is my favorite color! Also, have you ever heard of a show called Yu-Gi-Oh? You should do a whole bunch of research on it and do a wonder of the day about it! I already know the clue: Its time to duel with the king of games tomorrow at wonderopolis. Hint, YuGiOh means king of games. Also, you should do a wonder of the day about wonders of the day! Give me credit for both wonders if you do them!!!!!!!! Which of the following is NOT another name for sea glass? Sea glass gets smoothed over time by the tumbling action of all of the following except what? Less weathered glass that can be found along large lakes is sometimes known by what name?